Join us at the 6th Annual Allegheny Ukulele Soirée! The Allegheny Ukulele Soirée is Pennsylvania's longest running Ukulele Festival. 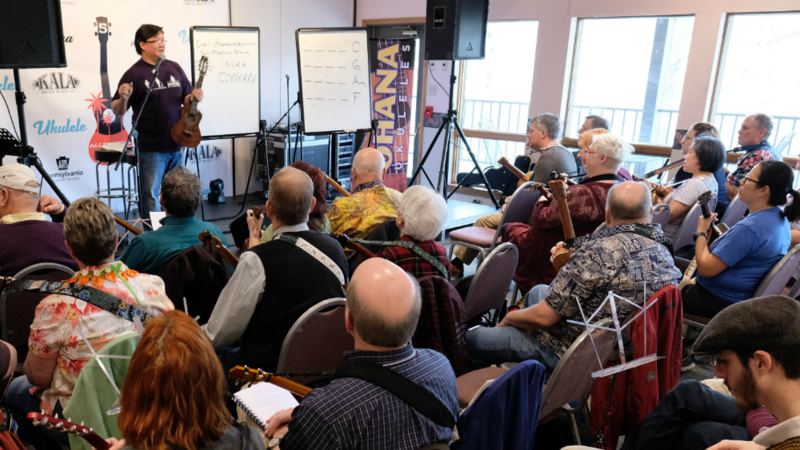 Each year, the Soirée draws ukulele enthusiasts from all over the country to Altoona, PA for a weekend of amazing concerts, skill-building workshops, and friendship. Headlined by top ukulele artists, and backed up with high-quality instructors, the Allegheny Ukulele Soirée is one of the premier ukulele festivals in the East Coast/Mid-Atlantic region. A Bigger & Better Venue! We're upsizing our venue this year to the Altoona Grand Hotel! With capacity for nearly 500, we have tons of room to stretch our legs...and fingers! Be sure to checkout our vendor room, which will have one of the largest selections of Ukes and Uke vendors in Pennsylvania! With over 30 workshops to choose from, we will be running up to 4 concurrent workshops at a time. Our 2019 festival also will see the return of our film series - so if you haven't yet seen "Life on Four Strings", "Under the Boardwalk" or others, here's a great opportunity to catch the latest Ukulele documentaries! The next Allegheny Ukulele Soirée is May 3-5, 2019 at the Altoona Grand Hotel in Altoona, PA.